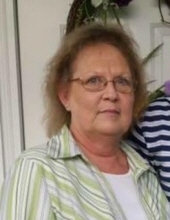 Cynthia Anderson, age 60 went to be with the Lord on January 16, 2019 with her loved ones by her side. She was born on March 20, 1958 in Hattiesburg. She was an active member of Sandy Run Worship and Raise Center. She loved walks on the beach and listening to the waves crashing. She also loved to flower garden, but she loved spending precious moments with her grandchildren and family the most. She was preceded in death by her parents, Fred and Fredna Berry. She is survived by her husband of 42 years, Terry Anderson; her three children, Terri (Jason) Lee of New Hebron, MS, Teresa (Jesse) Palacios of Gulfport, and Jonathan Anderson of Hattiesburg, six grandchildren, and two sisters, Donna Roberts of Hattiesburg and Jean Craft of Magee. To send flowers or a remembrance gift to the family of Cynthia Lynn Anderson, please visit our Tribute Store. "Email Address" would like to share the life celebration of Cynthia Lynn Anderson. Click on the "link" to go to share a favorite memory or leave a condolence message for the family.